Planning your Africa travel itinerary? Track down Lewa, Shaba and Samburu, capturing the landscape’s rugged terrain, unexpected wildlife and spectacular panoramas during game safaris in Kenya. Names of places always tell a story or hold some promise for the curious visitor. For me, Meru, Shaba and Samburu were names that evoked images of wild, rugged terrain, untouched by the trappings of modern life. The discovery of the actual places was something worth writing about. The Lewa Conservancy is probably one of the most tranquil places I’ve ever visited to view game. At sunset, the skies stretch out into a picturesque display of cloud and color, painted in dusky shades of pink and yellow, leaving a slowly dulling blue firmament lined with hints of silver and gold. Dreamy! The winds whip sharply about the vast plains swaying stubborn branches and crossing whatever seems to be in their way. I remember looking out from the bumpy comfort of our safari vehicle with a Maasai blanket wrapped around my legs, enraptured by the moment of adventure, art and nature that the plains seemed to promise. In our early afternoon game drive at the Lewa Conservancy, we came frightfully close to a herd of elephants grazing. The matriarch was none too pleased and came forward, then backing away, lifted her long trunk up high as if to declare something we should instinctively understand (that’s her on our cover photograph!). It wasn’t until dusk when we arrived at Lewa Safari Camp where we had a delightful little welcome from a fluffy bush native. This little creature had us a tad frightened with all the commotion it was causing in the tree, at least until we saw what it was. In torch-light, it stared out at us with round amber eyes looking excited and curious. Aww… I even felt silly for having been afraid! A few seconds later it had disappeared back into the tree and continued jumping. 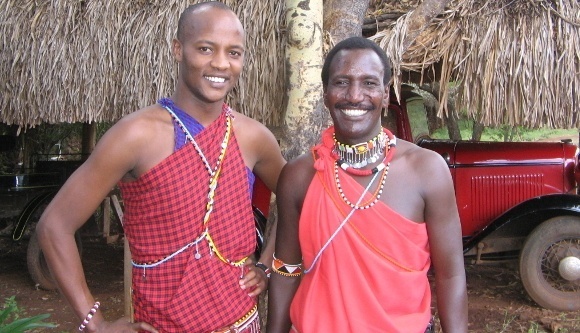 Next we visited the Lewa Wilderness where we had the pleasure of encountering a charming, well-spoken, tall Maasai manager dressed in traditional gear. His explanation about the bush-walks was quite fascinating. The Maasais live wild, own large herds of cattle and understand the animals around them like no-one else. Our next destination would be Samburu Game Reserve, where we would spend the night at Elephant Bedroom Camp. With the pleasure of a friendly, versatile chef at our service, we enjoyed the perfect blend of very savoury flavours with a cheese dish providing a hint of something Mediterranean. Shaba and Samburu are home to the Northern ‘Special 5,’ a unique set of animals whose particular species are quite comfortable in Kenya’s hotter, drier north. These not-so-little creatures are the Gerenuk with their long necks and funny little faces (the creature we saw earlier); the Grévy’s Zebra which is the largest type, with a mule-like long, narrow head; the Somali Ostrich flaunting a grey-blue neck; the Reticulated Giraffe; and the Beisa Oryx. You will find some of these brazen browsers in Lewa but the place to spot them all is definitely up north! Heading back to Nairobi, we had one last place to visit. Saruni Samburu lodge is set adventurously high up on an impressive hill that has a spectacular view of game in the park below. 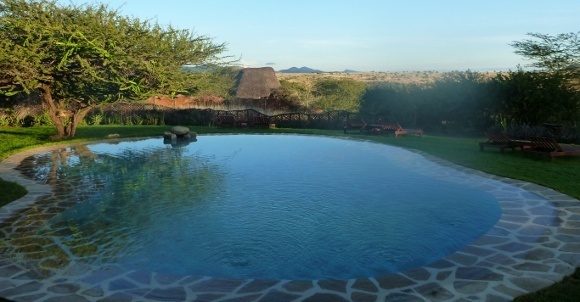 The camp boasts a swimming pool at one of its higher points, perfect for sun downers and private dinners. The views northwards stretch to the majestic Mathews Ranges and if lucky, you will be able to spot game below at the waterhole. We had a lovely light lunch here that included fresh salmon salad and cheese and crackers afterwards served with grapes. It was hard to leave the views: they’re addictive. For anyone who’s planning a self-drive, make sure your tyres have good grip because this is a lot like taking your 4×4 on a hike! I’ll let you in on a little secret about travels in the bush if you don’t already know: it’s exactly where comfort meets adventure, surrounded by nature and even fine dining. Whether you’re soaking up some sun or tracking game, at the best of accommodations you come back to creature comforts. Pristine white sheets luxuriously spread across comfortable king-size beds with pumped-up pillows, beautiful stone sinks that have soft, flattering mirror lights and then of course, the sumptuous meals and tropical juices. Note again: only at the best of them!